And we are pleased to announce that we are now able to start shipping to those who ordered in advance. We are happy to receive orders from our Danish neighbors. For that reason we are going to reduce shipping cost to EUR 4,90 to Denmark. 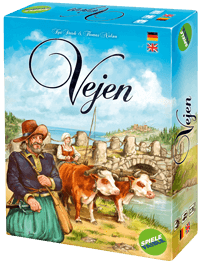 Do you want to find out what VEJEN is about? You are more than welcome to visit us at one of the events listed here. Or why not just order your own copy from our shop? Or send me an e-mail at henning@spielefaible.de with a short description of your business concept. A special offer is waiting for you!